A brown padded envelope arrived in my mailbox this past summer from the International Brotherhood of Magicians office in St. Louis, Missouri. It was a great surprise finding a letter from IBM president Shawn Farquhar, a lapel pin, and this certificate for the Order of Merlin. Wait – Merlin – what? Let’s go back in time. About 1988 I joined the Tacoma Magic Club. It was my first small step into the world of magic. You need to perform a ten minute audition to join. As a beginner performing magic for a room full of experienced performers it can be nerve-wracking. Each meeting I attended (thanks, John Amidon!) was a learning experience. It still is, actually. The Tacoma Magic Club is also the International Brotherhood of Magicians Ring #70, the Great Virgil and Julie Magic Ring. Joining a local club means that you’re encouraged to become a member of the International Brotherhood of Magicians. It’s as close to a “magician’s union” as you can get. Joining means you receive their monthly magazine, The Linking Ring, have access to online resources, can attend their annual convention, have access to discounted liability insurance, etc. 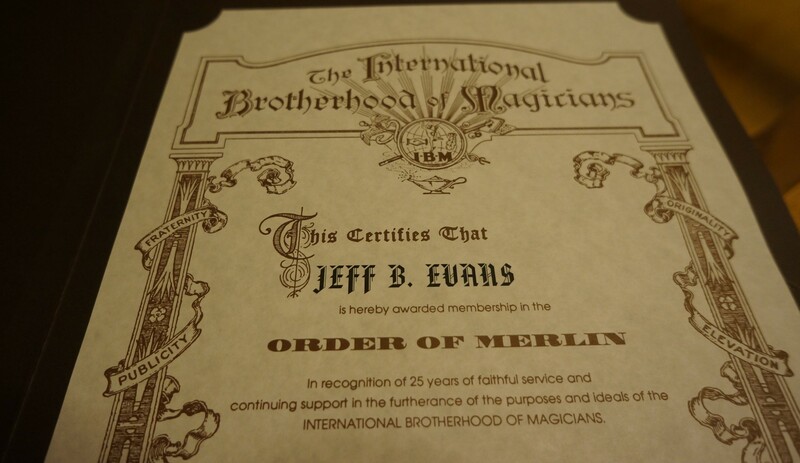 Members who belong for twenty five years become a member of the “Order of Merlin.” It’s a milestone, as the ranks of this relatively exclusive club include many of the best amateur and professional magicians around the world. 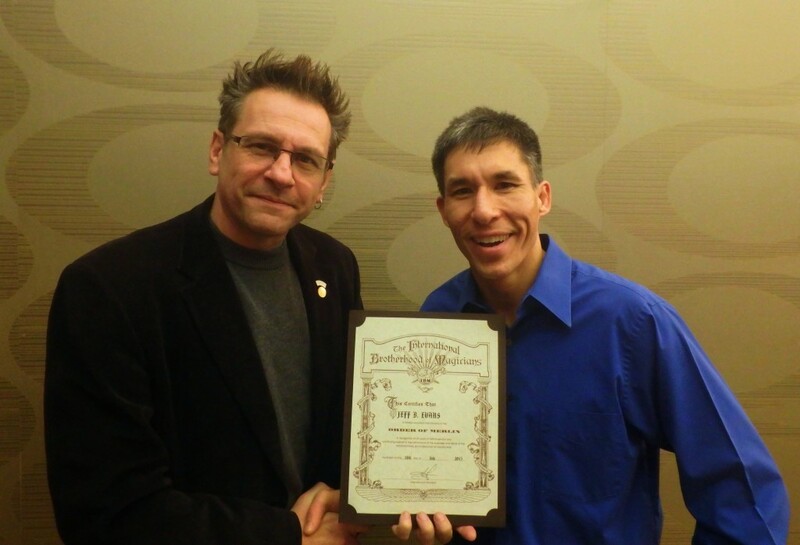 Even better: International President Shawn Farquhar signed my certificate. Shawn is an incredible performer who has done it all: close-up, stage, illusions, cruise ships, lecturing for magicians around the world, creating routines that thousands of performers use in their shows, appearing on TV, and he’s done it all for decades. He is also a good friend. When I was hosting a regional magic convention, the Pacific Coast Associations of Magicians convention, Shawn and his friend drove down from Vancouver, B. C. to spend a day taking me step-by-step through the process of planning to host hundreds of magicians. He did this without being asked, and it was a huge help in making the 1998 PCAM convention in Tacoma a success. This entry was posted in Uncategorized and tagged International Brotherhood of Magicians, Jeff Evans, Order of Merlin, Shawn Farquhar, Tacoma Magic Club. Bookmark the permalink.